なぜバットガールなのか？...「バットマンはいつも勝つ」から！ :: How Was Bat Girl Born? Because "Batman Always Wins"
Hello! Bat Girl reporting for duty. The Bat Girl character was born under rather silly circumstances. Many of you were probably puzzled by the title. But those of you outside of the U.S. may find this completely unnecessary information interesting. In the U.S., it's a known "fact" (within the fictional realm), or an urban legend/meme, that "Batman always wins." If you were to run an image search with "Batman always wins," you won't see the end of it. Most of them are of humorous nature, but you'd also find many arguments and proofs how Batman always wins against any villain or other superheroes. I wanted to channel this victorious part of Batman's character, but also wanted to pay homage to the first Batgirl Barbara Gordon, who holds a doctorate in library science. (I think it's cool she is tough and bookish.) But alas, I'm the farthest thing from a redhead bombshell, so my character's look also pays homage to the 3rd and the only Asian Batgirl, Cassandra Cain. I was discussing the idea with the super-talented Japanese American illustrator Enfu-san. 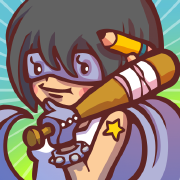 Since it's probably not wise to draw a Batgirl-like character as is, the "Bat" became a baseball bat (it was my idea, so please don't blame Enfu-san for the silliness). ...I know, not too deep. Nonetheless, I appreciate that Enfu-san kindly agreed to draw the art among his busy schedule, and came up with the wonderful, cute-and-tough-at-the-same-time images. As such, Bat Girl was born as an Asian super heroine who excels in information gathering--and hopefully always wins due to the superior information. I will try my hardest to live up to the name!